At Khao Yai National Park, the Kaeng Hin Phoeng in Nadi District of Prachin Buri is a stretch of river noted for its wild beauty. The water is very vigorous during the rainy months (June-October), and some stretches are designated Level 5, the uppermost limit to whitewater rafting. On the western border, Kanchanaburi is a popular adventure destination thanks to its mountainous terrain, covered with forests and crisscrossed with a network of rivers. Jungle rafting can be arranged from a mountain pass to the stunning Lawa Cave, a two-hour journey. Bamboo and inflatable rafts are also available for a trip down the Songkalia in Sangkhlaburi. Rafting is fast gaining popularity among the young and young-at-heart. The mountainous regions of the North are the natural venue for whitewater rafting, especially after the rains from June to October when the rivers swell with floodwater. But first-class rafting is also to be found in the northern reaches of the central region. There are five levels of expertise, and all require experienced guides to lead them. Mae Hong Song's Pai River is perhaps the most famous venue, as it smashes its angry path towards Myanmar. A raft trip starts at Ban Nam Kong, 65 km from Pai and continues through virgin forests, waterfalls and 15 sets of rapids, a journey time of about five hours. One of the oldest rafting destinations in the country, Chiang Rai continues to draw adventure seekers from all over the globe. In Chiang Rai, bamboo rafts and inflatable boats are available for the journey down the Mae Kok, the province's major artery. 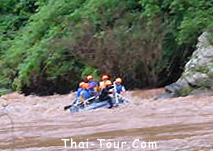 Rafting down the Mae Chaem through Ob Luang George in inflatable boats is available through Mae Sot Travel. Another challenging route is the Mae Tuen in Omkoi District, where the river rushes through virgin forests to end at the Pha Dam Waterfall. No rubber raft is available at the site, so it's best to book a trip with a tour agent in Chiang Mai. The headwater of Phetchaburi River, the province's major artery, lies within Kaeng Krachan National Park. The river offers good rafting; a trip through its rapids and small tributaries takes about six hours. As a rule, canoeing and kayaking is available at the destinations that provide rafting. Nakhon Nayok, a small province to the north of Bangkok, is a new destination for adventure tourism. Its rivers originate in the Khao Yai range and flow down to meet the arterial Bang Pakong River, which empties into the Gulf of Thailand. Nakhon Nayok has several waterfalls, the most popular being Wang Takhrai. Canoeing here is relatively new. The best time to visit is June-October. Starting point for a canoe journey is the stretch of Wang Takhrai canal where it flows through a coffee plantation. The waterway is quite narrow and therefore unsuitable for larger vessels. The route has no difficult rapids, but its many twists and turns more than make up for it. Safety is paramount in whitewater rafting. Life jackets and helmets must be worn at all times. Your guide should explain to you all relevant safety procedures before you go, and check weather reports and the condition of the river. You should be able to swim if you wish to go whitewater rafting. popular adventure destination. The hub of activities is Umphang District on the border with Myanmar which is now accessible via a winding mountain route from Mae Sot, the centre of border trade. The forests of Umphang are the source of many rivers, the most important being the Huai Mae Klong, a popular rafting route with its many rapids and scenic backdrops of jungle. There's also a rafting route from the breathtaking Thi Lo Su Waterfall which takes three to four hours. Kang Hin Phoeng: This is another stretch of river in Khao Yai National Park noted for its wild beauty. The water is especially challenging in the rainy season months of June to October, and it is a favourite place for whitewater rafting. The passage along this stretch of the river will take three hours or more. Day 1 : Depart Bangkok for a three-hour drive to Prachin Buri via Chachoengsao. After lunch, proceed to Kaeng Hin Phoeng River in Khao Yai National Park, swimming and elaxing at leisure. Then, on to an informal training session with an expert on local conditions to familiarise you with the contours of river, the safety equipment and procedures. Day 2 : After breakfast, a scenic drive into the National Park followed by walking tour through the jungle. Arrive at the starting point of the rafting expedition: A wilder tretch of the river with spectacular rapids designated Level 5 throughout. Conditions for rafting here are not only scenically impressive, but also exciting. The passage along this stretch of the river will take three hours or more. Lunch beside the river, then two more hours of rafting on fast-moving water before returning to base at the National Park. Drive back to Bangkok along the beautiful Khao Yai-Pak Chong-Muak Lek-Saraburi route. Level 1 : Simple, easy rapids. manoeuvring the raft around obstacles and rocks. Level 3 : Moderate rapids where rafting becomes exciting. It is necessary to hold on at times to stay in control of the raft. and control raft al all times. Very exciting rafting. Level 5 : This level of whitewater is the uppermost limit to rafting. The river is wild, with a rapid current and difficult rapids, usually very steep. Level 6 : Extremely difficult rapids, dangerous for rafting. It is important to ensure that you are in good health, and fit enough to enjoy this activity. Children over 12 but under 16 must be accompanied by responsible adults. For children under 12 years or for elderly people, only the Thi Lo Su Waterfall programme in May and June is recommended.